I struggled with my faith over a period of about ten years. I felt hopeless, plagued with doubts and feeling like God was just going to leave me this way. My heart was hardened, which is a profoundly empty feeling. When you don’t believe in God, you can feel the emptiness in your heart – like something should be there, but isn’t. It’s actually a strange sensation. I didn’t believe in God intellectually, but emotionally I felt as if He were there, watching me struggle with these doubts. Then, in a new bible study I had joined, it was again emphasized that we should read the Bible every day and pray fervently. Again, I thought, “Ok, I got the message. I can do that.” Then, I really felt God saying, “No, I don’t think you’ve received the message yet” when a speaker at my MOPS group again emphasized the importance of daily Bible reading and praying. When I arrived home that day I started that Bible and read until I was caught up to the current day. I also got out my copies of “The Power of a Praying Wife” and “The Power of a Praying Parent” and my prayer journal and just spent a good amount of time with God. My heart and mind felt more open, as if in that one fervent time of prayer God said “that’s was I was waiting for – for you to be diligent and authentic in asking me into your heart.” The disciplines of time with God’s word and prayer have increased my faith slowly but surely and released me of my doubts. Many of my questions may go unanswered, but the faith I have now means I don’t need all the answers. Lord, remind me to start each day by spending time in prayer and in your word. 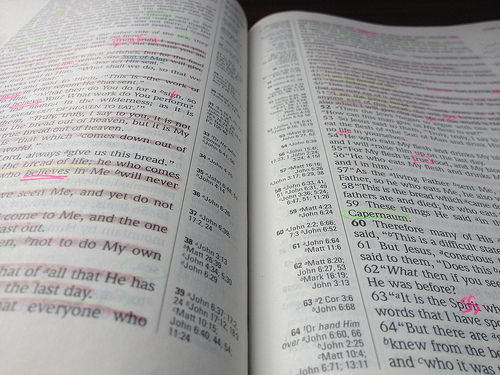 I just started the one-year Bible again for 2013 and it’s not too late! Spend some time in God’s word today. If you don’t feel led to any particular passages or don’t want to commit to a full year, try starting with one or two passages out of the book of Proverbs. Oh Heather. This is exactly what I needed to read today! Thank you for stopping by – I appreciate the feedback!